Outsourced workers at the University of London are striking for equal rights and for recognition of the IWGB union. Their ‘3 Cosas’ (3 things) campaign is demanding equal sick pay, equal holidays, and equal pensions. They are also protesting against potential job losses following the closure of university buildings. They are striking on the 27th and 28th November. Central buildings at the University of London are to be closed to the public today in the first official strike by outsourced staff in the university’s 170 year history. Today’s strike comes on the University of London annual Foundation Day, attended by HRH Princess Anne. Students and striking staff have called a demonstration which is expected to disrupt the Princess’s visit, and call attention to the strikers’ demands. The University of London, the umbrella institution for over 100,000 students in the capital, has announced that members of the public – including students intending to use the libraries – will not be allowed in to the buildings today. The caterers, cleaners, security and porters are demanding the same working conditions as in-house employees. Negotiations at ACAS on Friday morning fell through after the employers failed to make any concessions to the trade union. 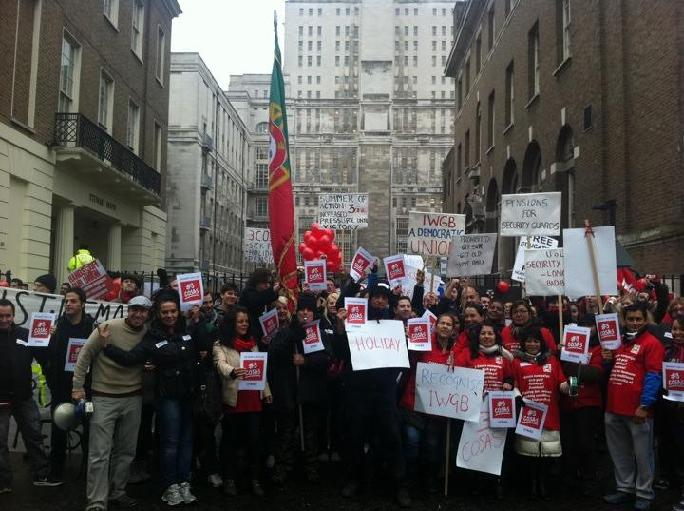 The strike is part of the ‘3 Cosas Campaign’ – meaning ‘3 Things’ in Spanish, the first language of the majority of low-paid workers at the University. The demands are for sick pay, holidays and pensions in line with those received by in house staff. The strike will be continuing until Thursday at 3pm. - The picket line will be at Senate House, next to Russell Square at 6am-1pm on Wednesday, and 6am-3pm on Thursday. - The protest will also be taking place at 6pm, again at Senate House. Outsourced workers at the University of London are striking for equal rights and for recognition of the IWGB union.